Rolls-Royce 200EX | What Car? Rolls-Royce describes it as an experimental car, but with the company releasing an all-new model next year codenamed RR4 don't expect too many changes from this concept vehicle. The 200EX is a four-door saloon that Rolls-Royce claims to have 'more panache and bravado' than you might have expect from a Roller. The 200EX is powered by a new V12 engine, but further details about the engine are scarce. Also included on the car is the latest evolution of the company's iconic front grille which, with its sides curved inwards and the vanes set back into the opening, Rolls-Royce likens to the front of a jet engine. The car also has the same rear-hinged coach doors that are used on the Phantom, but in this concept car they open though 83 degrees, offering the widest rear access of any car. 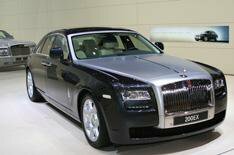 Rolls-Royce is also showing its mildly revised Phantom here in Geneva. It has a new front bumper, 21-inch alloy wheels and LED door handle lights. The interior has new front and rear door cappings, with integrated grab handles and new reading lights in the rear pillars to provide additional illumination. Rolls has also repositioned the rear climate control, volume control and electric window switches and housed them in a wood veneer door panel.